The Canada national rugby union team represents Canada in international rugby union. They are governed by Rugby Canada, and play in red and white. Canada is classified by the International Rugby Board (IRB) as a tier two rugby nation. There are ten tier one nations, and eight tier two nations. Canada competes in competitions such as the Pacific Nations Cup and the Rugby World Cup. Canada has been playing international rugby since the early 1930s, making their debut in 1932 against Japan. Canada have competed at every World Cup since the tournament was first staged in 1987, the only North American team to do so. Canada achieved their best result at the World Cup in 1991, where they reached the quarter-finals. Canada is a dominant power of North American rugby and currently ranks third in the Americas after Argentina and the USA. The team has achieved victories over traditionally stronger Six Nations teams such as France, Wales, Italy, and Scotland on at least one occasion in past years. Canada is currently ranked 18th in the IRB World Rankings. In 2013, Canada joined the IRB Pacific Nations Cup, playing matches against Fiji, Tonga, Japan and neighbouring Tier 2 team USA. In 1874 the first North American international game took place in Cambridge, Massachusetts between McGill and Harvard universities. Later that same year a second game was played, but this time Harvard were the hosts, and the game was played with early "American Football" rules. Today, in carrying on the oldest annual sporting competition in North America, McGill University and Harvard University continue the tradition of competing for the Covo Cup, at alternating venues each November, using the original rules of rugby football. McGill University can therefore lay claim to being the oldest rugby club in Canada, but due to rugby's popularity among students and the McGill University Rugby Football Club's affiliation with the university, the claim as the oldest independent rugby club goes to the still active Westmount Rugby Football Club. A Canadian Rugby Football Union was established in 1884, although this organisation went on to become the Canadian Football League, as rugby football in Canada evolved into Canadian football. In 1902–1903 the first Canadian team toured Britain. In 1909, Earl Grey, then Governor General of Canada, donated a trophy to the CRU to be awarded for the Rugby Football Championship of Canada. This trophy became known as the Grey Cup. However the rules used in Canada were vastly different from the rules used in countries that were part of the IRB. In the years that followed, the CRU would legalise forward passing and make other changes that would make Canadian football a totally different sport, similar to American football. During World War I and II rugby union was suspended but in the inter-war period there was something of a renaissance. In 1919 a Canadian Services team played overseas against representatives from England, New Zealand, South Africa and Australia. The formation of the Rugby Union of Canada took place in 1929 and this was followed by a tour of Japan by a Canadian representative side in 1932 to help foster trade between the two countries. About half the team were Canadian born (mostly British Columbia players) and the rest were originally from Britain. They lost 9–8 and 38–5 in the two test matches. The original Canadian Rugby Union disbanded just before World War I. Canada's team to the United Kingdom in 1962 was dominated by British Columbia players. The Rugby Union of Canada was re-formed in 1965 as the Canadian Rugby Union. The 1966 British Lions played a non-cap match in Toronto on their way back from Australia and New Zealand, a match they won 19–8. Canada established themselves as the strongest team in North America, though they struggled to compete with the major test-playing nations in Europe and the Southern Hemisphere. Canada were one of the 16 nations that were invited by the International Rugby Board (IRB) to compete at the inaugural Rugby World Cup in 1987, hosted by both Australia and New Zealand. Canada were grouped with Wales, Ireland and Tonga in Pool 2. In their first ever World Cup match they defeated Tonga 37–4. However they lost their subsequent matches 46–19 to Ireland and 40–9 to Wales, and finished third in the pool (not advancing to the finals). Canada had to qualify for the 1991 Rugby World Cup. Canada took part in the Americas tournaments, and finished first in the Americas qualifying standings. At the 1991 Rugby World Cup, Canada was placed into Pool D, alongside France, Romania and Fiji. Canada beat Fiji and Romania but lost their fixture against France 19–13 to finish second in the pool, advancing to the quarter-finals. They were then knocked out in the quarterfinals by the All Blacks, 29-13. The 1991 tournament stands as Canada's best ever finish in a Rugby World Cup. Canada beat Wales 26–24 on November 10, 1993 at Cardiff Arms Park; and beat France 18–16 on June 4, 1994 at Twin Elms Rugby Park in Nepean, Ontario; and battled to a 27–27 draw against Ireland on June 27, 2000 at Markham, Ontario; and chalked up a 26–23 win against Scotland in Vancouver, British Columbia on June 15, 2002. The win over Scotland was the start of a streak of seven victories before losing to Wales in Cardiff. Canada has never beaten England in six games, but has played their national XV, B team, and Under 23 teams eleven times (for which Canada awarded its players international caps.) The most notable result was a 15–12 victory over a strong England XV on May 29, 1993 at Swangard Stadium in Burnaby. Unfortunately for the Canadians, on the eve of the match England's management chose not to award international caps (due to fact that some players were touring with the British and Irish Lions in New Zealand at the time.) Additionally, before defeating Scotland proper in 2002, Canada beat Scotland XV 24–19 on May 25, 1991 at Saint John, New Brunswick. As they were quarter finalists in 1991, they automatically qualified for the 1995 Rugby World Cup. They were in Pool A with the hosts South Africa, defending champions Australia, and Romania. Canada finished third in the pool, winning their match against Romania but losing 27–11 to Australia and 20-nil to the Springboks. Canada won the now defunct Pacific Rim tournament three years in succession in 1996, 1997 and 1998. Canada finished second in Round 4 of the Americas 1999 Rugby World Cup qualifying, losing only to Argentina, and qualify for the World Cup. Canada finished third in their pool (with France, Fiji and Namibia), winning their match against Namibia but losing their other two fixtures. The victory against Namibia was uncharacteristic for Canada, as they ran the score up to 72–11, one of their most lopsided victories, as there was a very slight statistical chance that they could have advanced on points scored. This trashing was the one bright light in an otherwise gloomy and disappointing 1999 World Cup performance. Like all second- and third-tier nations, the Canadians have had problems having these players available for important games. As a consequence Canada has slipped out of the top 10 rugby union nations, but has nevertheless provided top class players such as Dan Baugh, Rod Snow, Mike James, Colin Yukes, Dave Lougheed and Jamie Cudmore to teams in England, Wales and France. The Canadians qualified for the 2003 Rugby World Cup in Australia. Canada qualified as Americas 1, finishing at the top of Round 4 Americas tournaments, winning five of their six fixtures to enter the 2003 World Cup in Australia, their fifth world cup in a row. Canada's sole win was a 24–7 result against Tonga as they lost their games against Italy, Wales and the All Blacks. Since 2003 Canada has played host to the Churchill Cup, making the final in 2010 but losing to the England Saxons 38 to 18. In 2004 and 2005 they replaced China in the Super Powers Cup. For the 2004 Superpowers Cup, Canada was substituted for China. In 2005 the competition was renamed the Super Cup. Canada beat Japan 15–10 in the final. In 2006 Canada completed the qualification process for the 2007 Rugby World Cup. They were in a 3-team group also containing Barbados and the United States. Each played the other once. 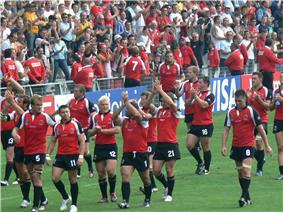 On June 24, 2006, Canada defeated Barbados 71–3, in Bridgetown, their largest ever win. Canada achieved a record win over the USA in the match in Newfoundland on August 12, 2006, defeating the USA 56–7 in front of a capacity crowd, when player James Pritchard scored a national record 36 points with three tries, six conversions and three penalties in the match, beating the record of 29 he had set against Barbados in their previous match. The win assured Canada of a place in the 2007 World Cup as Americas 2 in Pool B. Also that year, a Canadian team won the NA4 and the national team beat the US earlier in the Churchill Cup. 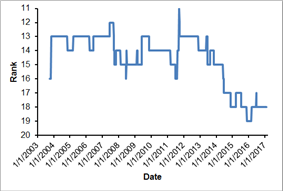 Going into the World Cup Canada were ranked as severe outsiders, and given odds of 5000/1 to win the tournament. Pool B also contained Australia, Fiji, Japan and Wales. 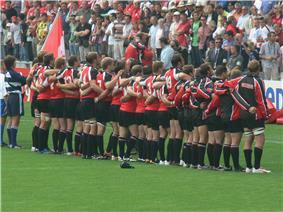 In their opening match in Nantes on 9 September the Canadians lost 42–17 to Wales. They followed this with a 29–16 loss to Fiji, whom they had needed to beat to have realistic hopes of progressing to the Quarter Finals. 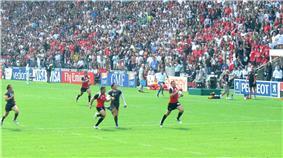 They drew 12–12 with Japan in Bordeaux, conceding an injury-time try by Koji Taira. In their final game they lost 37–6 to an Australian side consisting mostly of second-string players. It meant they finished bottom of Pool B, and returned home from a World Cup without winning a single game for the first time ever. Following the 2007 Rugby World Cup a new epoch in Canadian rugby began with the installation of Kieran Crowley as head coach of the men's national team. By April 2008 the former New Zealand All Black took over coaching duties with aspirations to positively shape the Canadian rugby psyche and improve upon recent results. In Autumn 2008 the Canadians toured Europe, beating Portugal in their opening match, but suffering heavy defeats in their subsequent games in Ireland, Wales and Scotland. In 2009 the Canadians will host a tour by the Welsh and Irish. Canada beat the United States in a two-legged playoff game in July 2009 to qualify for the 2011 Rugby World Cup in New Zealand and enter the tournament as Americas 1. Canada began its Rugby World Cup preparations well, by finishing runner-up in the 2011 Churchill Cup for the second year in a row, losing 37–6 in the final to the England Saxons (England's second-string side). This good form carried on in a two-legged home and away series of warm-up matches against the USA Eagles. In the home leg on August 6 at the BMO Stadium, Canada secured a 28–22 victory in front a record 10,621 fans. In the away leg played on August 13 at Colorado, Canada won 27–7. Their warm-up schedule continued with a match against the Australian Barbarians on August 26, featuring several of Australia's World Cup squad, including Berrick Barnes, Drew Mitchell and Rob Horne. Despite a strong performance, particularly by the Canadian pack, the Barbarians claimed a comfortable 38–14 victory. 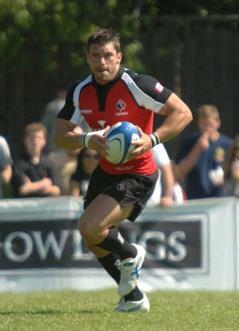 The Canadians played their final warm-up game on August 30, beating a representative Queensland Reds side 33–14. The Canadians began their 2011 Rugby World Cup on September 14 against Tonga, winning 25–20. They followed this up with a 46-19 loss to France on September 18. The team had only a 4-day turn-around after their first match, and let the game slip out of their reach within the final 20 minutes. They produced a repeat result of 2007, by playing to a 23-23 draw against Japan. Their Rugby World Cup concluded with a 79-15 loss against the All Blacks. Canada finished fourth in their pool, narrowly missing out on automatic qualification for the 2015 Rugby World Cup. Canada secured a spot in the 2015 Rugby World Cup on 23 August 2013, with a 13-11 win over the USA,40-20 on aggregate. They join Pool D with France, Ireland, Italy and Romania. Canada finished the tournament with zero wins, last in Pool D.
The national team currently does not have a permanent home stadium and as such play their matches at various locations across Canada. BMO Field in Toronto, Ontario has been proposed as the national team's home stadium, even though it cannot provide a suitable rugby climate year-round. However, rumours have the national team playing out of the proposed Whitecaps Waterfront Stadium in Vancouver, British Columbia if it is constructed. This would place the national rugby stadium in the country's main rugby stronghold of British Columbia, and in a city whose winter climate is considerably milder than that of most of the rest of Canada. In August 2011 it was announced that the national team would have a permanent training centre located in Langford, British Columbia. Below is table of the representative rugby matches played by a Canada national XV at test level up until 6 October 2015. Canada's 31-man squad for the 2015 Rugby World Cup. On 10 September, Jake Ilnicki was called up to replace the injured Jason Marshall. On 24 September, James Pritchard was called up to the squad to replace Liam Underwood after suffering an injury during Canada's opening game with Ireland. On 28 September, Pat Parfrey was called up to the squad to replace Connor Braid after suffering an injury during Canada's game with Italy. Note: Flags indicate national union for the club/province as defined by World Rugby. Last updated: Romania vs Canada, 6 October 2015. Statistics include officially capped matches only. Note, Gareth Rees points total is in dispute, some sources claim 487 while others including the IRB claim 491. Australian born James Pritchard is Canada's second highest try scorer and points scorer of all time, he also holds the record for most points in a match with 36 against the USA in 2006. Last updated: USA vs Canada, 21 June 2014. Statistics include officially capped matches only. - Green background indicates a win. Red background indicates a loss. Yellow background indicates a draw. 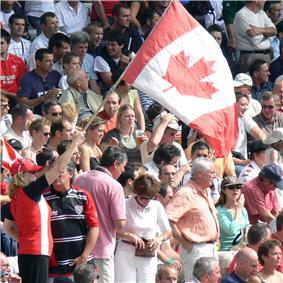 ^ "Canada beat Barbados 71-3 in Rugby World Cup qualifier". Caribbean Net News. June 26, 2006. Retrieved 23 November 2012. ^ "Canada book Wales RWC encounter". BBC News. 13 August 2006. Retrieved 28 April 2010. ^ "Canada claim Americas 2 spot". therugbyworldcup.co.uk. Retrieved 22 August 2006. ^ "Rugby World Cup 2007 Latest Betting - 07-11-07". Online-gambling-insider.com. 2011-11-18. Retrieved 2012-03-16. ^ "Wales 42–17 Canada". BBC News. 9 September 2007. Retrieved 28 April 2010. ^ Malin, Ian (17 September 2007). "Fiji send Wales a mixed message". The Guardian (London). Retrieved 28 April 2010. ^ Millward, Robert (26 September 2007). "Canada 12 Japan 12: Japan celebrates ending losing streak after draw". The Independent (London). Retrieved 28 April 2010. ^ Malley, Frank (30 September 2007). "Mitchell double helps subdue brave Canada". The Guardian (London). Retrieved 28 April 2010. ^ "Former All Black appointed Canada coach". rugbyweek.com. 18 March 2008. Retrieved 26 January 2013. ^ "Canada qualify for 2011 World Cup". BBC Sport. 2009-07-12. Retrieved 2009-07-13. ^ a b "World Rankings". World Rugby. Retrieved 1 November 2015. ^ "Canada lose tighthead Marshall". Planet Rugby. 10 September 2015. Retrieved 10 September 2015. ^ "Canada's James Pritchard called out of retirement to replace injured Liam Underwood". Rugby World Cup. 24 September 2015. Retrieved 24 September 2015. ^ "Patrick Parfrey replaces injured Connor Braid for Canada". Rugby World Cup. 29 September 2015. Retrieved 29 September 2015.